Last year I got Em a really cute shirt for St. Patty’s Day. It had a green shamrock on the front with a few buttons attached. It was really cute and simple. I’ve been wanting to do this same idea for an Easter egg. Now that I have the time, I gave it a try. I should tell you, I love to sew. But usually that means with a sewing machine. I’m not good at sewing on buttons, so I knew this was going to be a challenge for me. Once I got into the groove, it was really easy. You can also do this with any other shape, size, holiday, or event. I love that Em wanted to pick out the buttons to use on her shirt. It was a great way to spend time together and have her help and be hands on. A needle and thread. 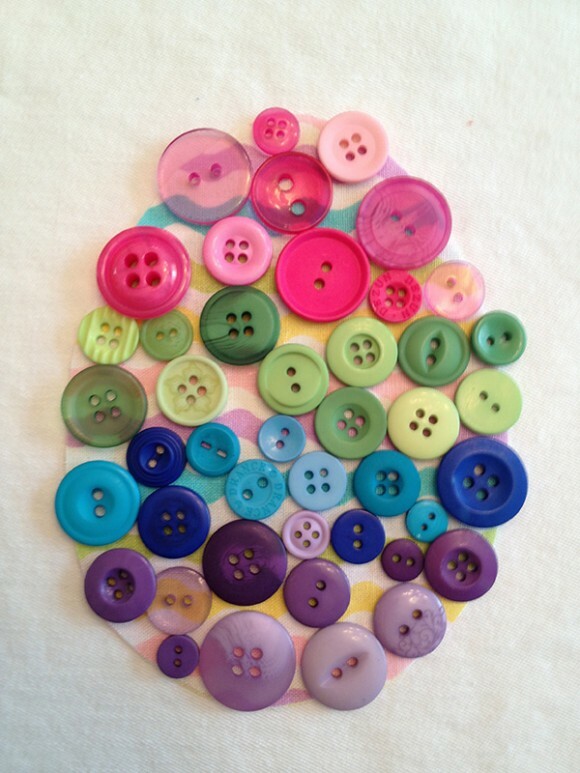 You can use the same color thread or match the colored thread with your buttons. 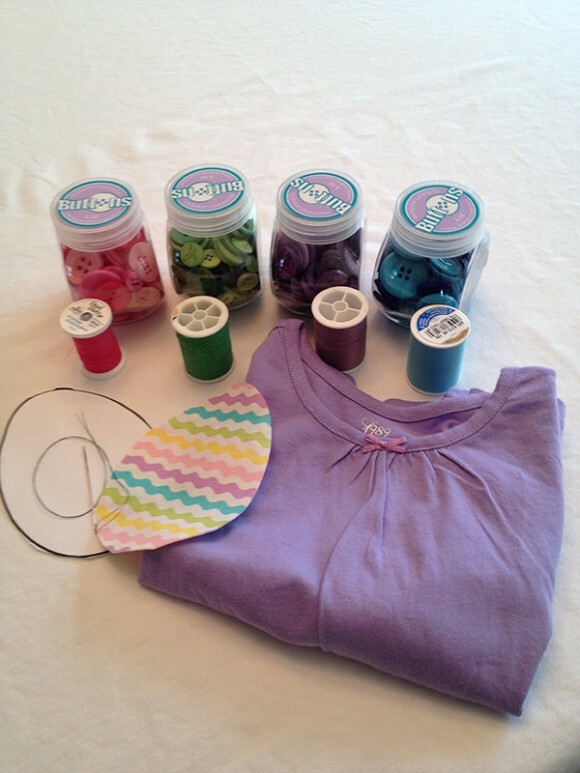 Fabric paint if you plan on writing on your shirt. I use corresponding thread and button colors. You don’t have to do this, you can just use one color that will work for all your buttons. You can see the little containers these buttons come in. I got them at Joanne’s for around $4.50 but you can always get a coupon to save even more. I laid out how I wanted my buttons to look once I sewed them on. This isn’t how they turned out, but it gave me a really good idea of where I want to place my buttons. One I got the buttons all sewn on to the fabric swatch, I placed it on the shirt. At this point, you can do one of two things to attach it to the shirt. You can either zig-zag around the edges, or you can use the double sided tape. Since I had planned on writing on the shirt with fabric paint, I choose to use the tape. I then traced my egg with the fabric paint to give it a finished look. If you’re going to sew it on, make sure you leave enough room around the edge to do so. Cut your fuzing fabric to match your egg. One you have the egg in place, use a hot iron to fuze it to the shirt. 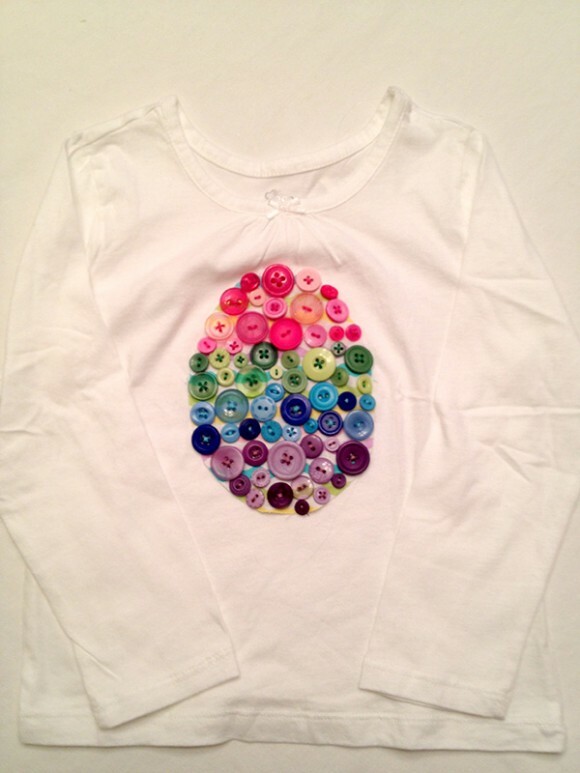 Pin the egg to the shirt inside out. Heating the shirt side. The amount of time it takes to heat the fabric won’t hurt your buttons. The fabric paint will give your egg a finished look so don’t worry about your edges at this point. Using washable fabric paint, draw around your egg to give it a finished look. I love the puff paint but any fabric paint will do. I wait until it’s completely dry before adding my messages. 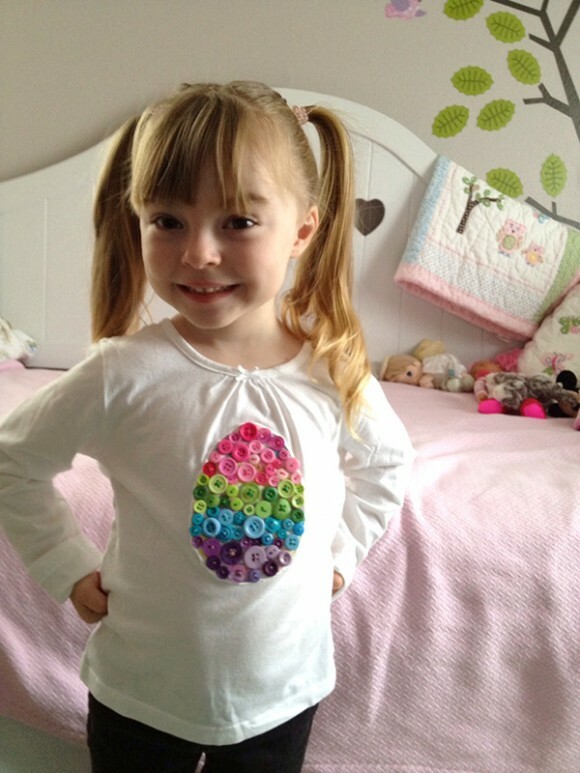 Here you go, one very cute Easter Egg shirt on an adorable little girl. She loves it and can’t wait to wear it!